Celebrating Thanksgiving abroad is an altogether different prospect, without the wider cultural participation, and potentially being unable to get hold of many of the most important Thanksgiving ingredients. 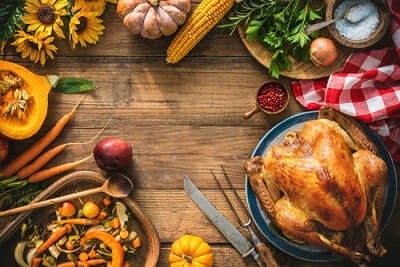 Most Americans living abroad soldier on though, so to help all those resolute souls out there, here are our top 5 tips for American expats celebrating Thanksgiving abroad. Sourcing specialist American ingredients in another country can be anything from difficult to impossible. Cranberries, pumpkins, and even a turkey can be tricky to track down. Many first-world countries will have specialty US food stores, or you’ll be able to order these items online, but you’d be advised not to leave it until the last minute or you’re likely to find yourself either empty handed or fighting with other Americans over the last item left. Even if you do start accumulating everything you need months in advance, some things will never be the same as back home. Accept this early on, and encourage your family or guests to accept it too, and things will run much more smoothly on the day. Many Americans comment on how small European ovens and fridges are, so even if you can find a good, big turkey, you may not be able to store it or cook it. Furthermore, Thanksgiving won’t be a national holiday, so plan to celebrate on the nearest weekend. Failing to adapt to your circumstances could severely dent your holiday happiness! If you can’t get a turkey, go with chicken, pork, or beef. If you can’t find pumpkins, try a local squash perhaps. Remember, turkeys, corn, and pumpkins are only traditional Thanksgiving foods because they were the only foods available to early settlers in America, who couldn’t source the foods they were used to in Europe. Embrace the spirit of the early settlers and use what’s locally available. If you’re inviting non-Americans, don’t expect them to have any idea what’s going on. Brush up on your history so you don’t seem like a nitwit when they start asking the inevitable Thanksgiving origins questions, and don’t expect them to bring American foods. It may also be wise to let them know in advance that they’ll be expected to say what they’re thankful for, as otherwise they might never forgive you for putting them on the spot without warning. The most important thing though is to remember to be thankful for the friends you’ve made during your adventure abroad, however clueless they are about our American ways. Living abroad can be hard, especially on traditional holidays when we inevitably think about our families and friends back home, but the most important thing about Thanksgiving of course is to focus on what we have, not what we don’t have. Be thankful for the people we are with, and the foods we have, not those things we don’t. Celebrating Thanksgiving abroad as an expat will never be quite the same, however look for the positives and be thankful and in no time you’ll find yourself inventing new Thanksgiving rituals and traditions that you may one day introduce to your loved ones back in the States, too.